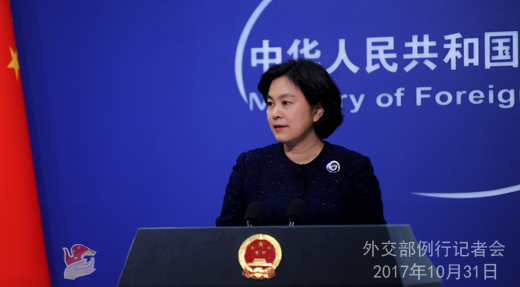 Q: We have noted the readout about China and the ROK's communication on bilateral relations and other issues. Does that mean China has changed its position on the THAAD issue and the China-ROK relations have taken a turn? A: China's position on the THAAD issue has been clear and consistent, which remains unchanged. We have noted that the ROK stated publicly that the ROK will not join the US anti-missile system, develop the ROK-US-Japan security cooperation into a tripartite military alliance or make additional deployment of the THAAD system, and the current THAAD deployment in the ROK will not undermine China's strategic security interests. We hope that the ROK will match word to deed and follow through on these remarks to properly handle the relevant issue. Properly handing the THAAD issue and removing the obstacles to China-ROK relations are the shared aspiration of the two countries and conform to the common interests of the two sides, we hope the two sides can jointly work to bring the bilateral relations back to the track of normal development. Q: What's the backdrop against which the readout was issued? What's China's expectation for the improvement of China-ROK relations? A: This morning, China and the ROK issued the press release on China and the ROK's communication on our relations and other issues. I believe you have noted and read that carefully. I would like to say that properly handing the THAAD issue and removing the obstacles to China-ROK relations are the shared aspiration of the two countries and conform to the common interests of the two sides. Recently the two sides have communicated on the relevant issues and reached consensus through diplomatic departments via the channel between Assistant Foreign Minister Kong Xuanyou and ROK Second Deputy Director of National Security Office Nam Gwan-pyo. As for our expectations, like what I said in my reply to the question just now, the improvement and development of China-ROK relations serve the common interests of the two sides. We hope that the ROK will follow through on its remarks and work with China to bring the bilateral relations back to the track of normal development. 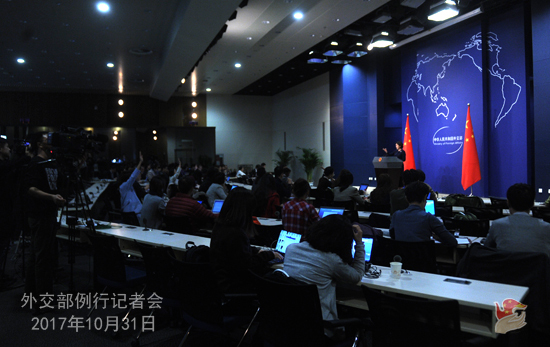 Q: China said several times that the people-to-people and cultural exchange calls for public support. As the ROK and China reached agreement, what change does China expect to see in public opinion? A: As we all can see, for some time, the feelings and relations between the Chinese and ROK people have been affected by the THAAD issue. We hope that the two sides can properly handle the THAAD issue and bring the normal exchange and cooperation in various fields back to the track of normal development. We believe this is of positive significance to the change of public opinion in the two countries. Q: Cuba is going to present a draft resolution against the US blockade tomorrow at the UN General Assembly. What is China's position on this issue? A: China always maintains that countries should develop relations on the basis of mutual respect, equality and mutual benefit. We are opposed to the US blockade on Cuba and have called on the US to fully lift its blockade on Cuba all along. We will continue to adhere to this position and hope the US and Cuba can develop their relations on the basis of mutual respect. Q: According to reports, On October 30, Kenya's Independent Electoral and Boundaries Commission announced the results of the new presidential election on October 26. The Jubilee Party's candidate and the incumbent president Uhuru Kenyatta was reelected as the Kenyan president with 98.3% votes. What's your comment on this? A: We have noted the relevant reports. As a good friend, good partner and good brother of Kenya, we fully respect Kenyan people's choice and sincerely hope that with a view to the interests of the nation and people, various parties in Kenya will remain rational, exercise restraint and properly resolve differences so as to ensure national peace and stability. Q: Yesterday three senior officials of President Donald Trump's campaign team were charged with different crimes. One of them told about the contacts with Russia during the election, which caused a shock to American politics. Some comments say that this may overshadow President Trump's visit to Asia, including his visit to China. Is China concerned about this? A: I won't make comment on what you said as it is the internal affairs of the US. When meeting with the overseas members and Chinese entrepreneur members of the Advisory Committee of the School of Economics and Management of Tsinghua University, President Xi Jinping said that he is looking forward to President Trump's upcoming visit to China. China stands ready to work with the US to accommodate each other's interests and concerns, properly resolve differences and contradictions, jointly promote China-US cooperation and achieve mutual benefit and win-win results with great vision and long-term perspective. At present, the two sides are remaining in close communication on President Trump's upcoming state visit to China. We hope that President Trump's visit will chart the course for future China-US relations and advance its sustained, sound and steady development. We believe this is also what the US people hope to see. It serves the interests of the region and beyond. Q: The ROK Presidential Office said that President Moon Jae-in will meet with President Xi Jinping on the sidelines of the Asia-Pacific Economic Cooperation (APEC) Economic Leaders' Meeting in Da Nang, Vietnam next month. Can you confirm whether this meeting will take place and what the two leaders plan to discuss? A: We always think that the high-level visit is important in spearheading the development of the two countries. As I understand, China and the ROK are coordinating on the relevant issue you mentioned. We will share with you the information once we have it at hand. Q: The Foreign Ministry Spokesperson said last week that a China-US meeting on drug control was held in Beijing yesterday and today. Could you please offer more details? A: As agreed by the two sides previously, the China-US meeting on anti-drug cooperation was held in Beijing on October 30 and 31, and the two sides will look into the projects for deepening cooperation in the anti-drug area. I would refer you to the competent authority for details. Q: The readout issued this morning mentioned that China and the ROK agreed to promote cooperation and exchange in various fields and return to the normal track at an early date, so what measures will be taken to implement this document going forward? A: China and the ROK's effort to bring back our cooperation and relations back to the track of normal development is in line with our shared aspiration and common interests. We hope the ROK will follow through on its remarks and create good conditions for the exchange and cooperation in various areas. Q: Recently the US Department of Justice indicted two Chinese nationals in connection with the export of fentanyl to the US. Has China been cooperating or assisting the US in relation to this case? Recently President Trump made some remarks about the opioid drug crisis in the US and he named China in particular when it came to fentanyl exports. What's your comment on this? A: I'm not aware of the specifics of the case you mentioned. As we said before, the Chinese government attaches great importance to the fentanyl issue. China has included dozens of fentanyl analogues into the list of controlled substances though there is no abuse of fentanyl analogues in China yet. Meanwhile, with a highly responsible attitude, the Chinese government has been actively cooperating with the US and other countries within a framework as the law allows. On October 4, State Councilor and Minister of Public Security Guo Shengkun co-chaired the first US-China Law Enforcement and Cybersecurity Dialogue (LECD) with US Attorney General Jeff Sessions and Acting Secretary of Homeland Security Elaine Duke. The First US-China Law Enforcement and Cybersecurity Dialogue Summary of Outcomes issued after the LECD says that China and the United States held discussions on the relevant issue and both sides agree to continue to enhance cooperation on narcotics control and law enforcement, including jointly combating the illicit production and trafficking of fentanyl and fentanyl-related substances and precursor chemicals. The Chinese government attaches great importance to the international joint management of the drug issue. With a strong sense of responsibility, it actively cooperate with the US and other countries within the framework of the UN Convention against Illicit Traffic in Narcotic Drugs and Psychotropic Substances and China's law. Q: Yesterday, a report from the South China Morning Post said that Chinese engineers have submitted a proposal to the Chinese government to build a 1000km tunnel to divert water from the Yarlung Tsangpo River in Tibet to Xinjiang, which would have a big impact on India and other countries downstream and trigger their concerns. What's your comment on this? A: According to my information, what you said is untrue. Q: The Pakistani foreign ministry said in a statement yesterday that they confirmed the identities of the two Chinese nationals kidnapped and killed in May through DNA tests. Can you confirm that? A: At present, the relevant authorities of Pakistan has confirmed that the two Chinese nationals kidnapped in late May in Pakistan were killed. We express our deep condolences to the victims and sincere sympathy to the families of the victims. The Foreign Ministry of China and our diplomatic missions in Pakistan activated emergency response mechanism immediately after learning the kidnapping. We have been in close communication and cooperation with each other and making all-out rescue efforts. 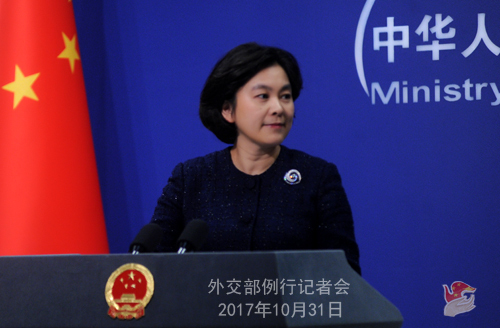 China hopes that Pakistan would continue with its best efforts to find the perpetrators and bring them to justice at an early date. China firmly opposes and strongly condemns all forms of terrorism and extreme violent acts targeting civilians. China supports Pakistan's counter-terrorism efforts and will enhance counter-terrorism cooperation with the international community to safeguard peace and stability in the region and beyond. China always attaches high importance to protecting security and the legitimate rights and interests of Chinese citizens overseas. We once again remind Chinese nationals who are abroad or planning to go abroad to take heed of relevant travel risk alerts and raise security awareness. Q: According to reports, the Cambodian Immigration Department said that it has handed over 61 Chinese nationals, including 19 from Taiwan, to the mainland, who were involved in extorting money over the internet and by phone in Cambodia. What is your comment? A: China highly commends and appreciates the Cambodian side for its adherence to the one China policy and its cooperation with China on cracking down cross-border crimes, including telecom frauds. China and Cambodia have been in close communication and cooperation in this field. The relevant department in China will handle suspects across the Taiwan Strait in accordance with law which will help get to the bottom of this case, effectively fight crimes, and protect the legitimate rights and interests of the victims. We believe we will have the understanding and support of people across the Taiwan Strait and the international community. As for the specifics of the case, the relevant competent department in China has released related information.